Surfers Healing Auction - Attention All Good-Hearted Surf and Art Lovers! What is the only thing that should be the most important part of the holiday spirit? Should we had to choose, it would most certainly be – helping others. Recently we have been writing about a successful charity auction held in the UK (have a look in Smile Britannia Charity Auction), and now we are moving to the other side of the ocean to follow up on yet another online auction which is powered by the people of good will and the good-heartedness of the urban and street art scene. 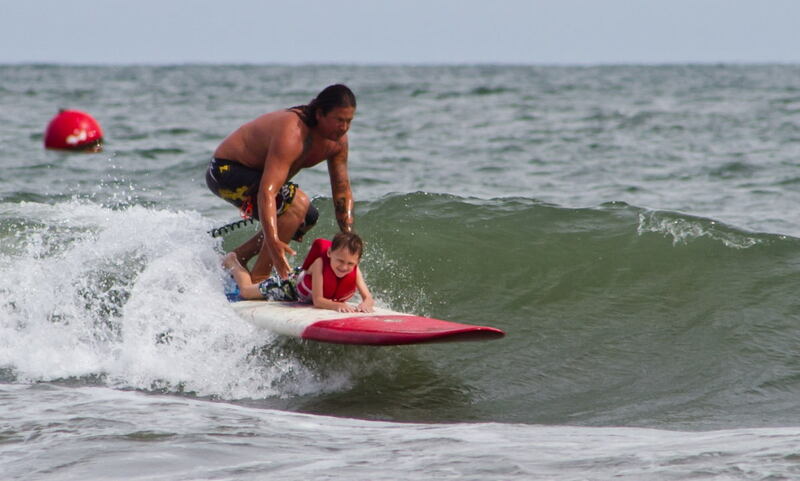 The organizer is Surfers Healing Foundation, an energetic group of people devoted to teaching children with autism how to surf. This inclusive organization is celebrating its fifteenth anniversary, walking the path of helping people understand and accept autism. The mission of Surfers Healing is to keep their camps completely free, and the Annual Surfboard Auction is one way for you to help! The Ritz-Carlton, Laguna Niguel Annual Holiday Surfboard Auction is a fundraiser to benefit Surfers Healing Foundation. The art and surf loving public will have a chance to acquire unique pieces, surfboards which were designed by famous fashion designers, artists and renowned surfers. At the same time, every bidder helps Surfers Healing Camp function as an open and free for all organization. This year, the 7th annual Surfers Healing auction is to raise funds for the Surfers Healing Foundation. Apart from the auction and an exhibition which coincides with The Ritz-Carlton, Laguna Niguel, a second exhibition will be presented at the Patagonia Surf Shop on The Bowery in New York City. The list of artists participating in the exhibition includes Damien Hirst, Michael Dweck, Kevin T. Kelly, Relax, Gregory de la Haba, Ben Eine, 2×4, Robert Williams, Julian Schnabel, 2×4, Tom Sachs, Ron English, Dana Louise Kirkpatrick and Len Prince. 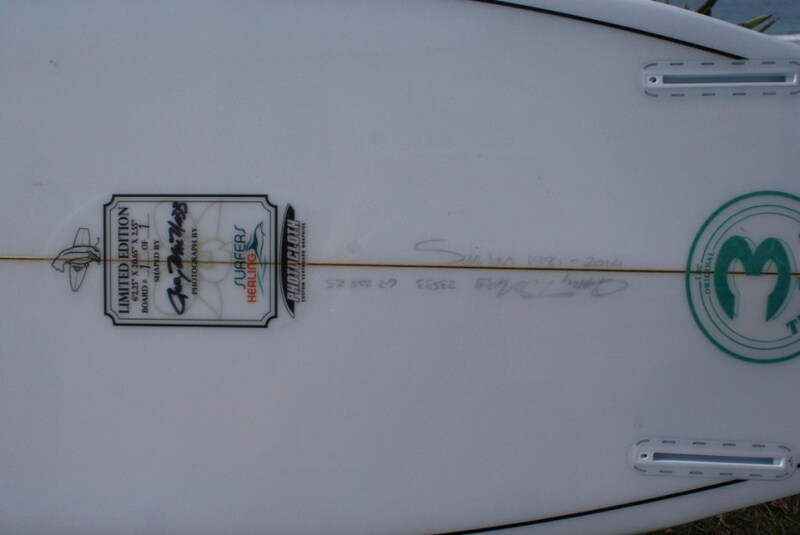 Check out our selection of boards you might like and how to bid on the next page. Be sure to participate in the auction, it is for a noble cause! The online auction will close at noon PST on Wednesday, December 31st 2014. In order to place your bid for a surfboard or a collectable, visit Seventh Annual Holiday Surfboard Auction at BiddingForGood. But, before you go and decide what item you would like to bid for, check out Widewalls’ Collectors’ Tip team favorites below (the prices listed alongside the pieces are leading bid prices at the time of the writing of the article). 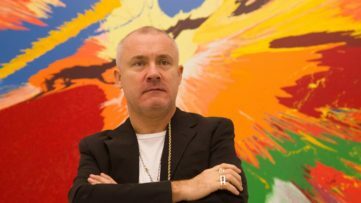 There is truly no need to present the life and career of contemporary superstar Damien Hirst. The Bristol-born installation, sculpture and painting oriented artist brings to the table an interesting surfboard with Hirst’s recognizable signature style. 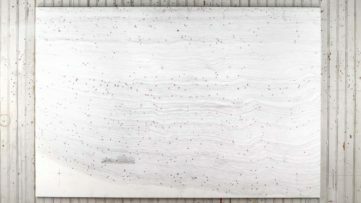 The 74 x 20 inches household gloss on surfboard piece’s current bid is $40,000. Another piece to keep your eye on is most definitely a board by Michael Peter Balzary, known to the wide public as Flea, a co-founding member of Red Hot Chili Peppers. 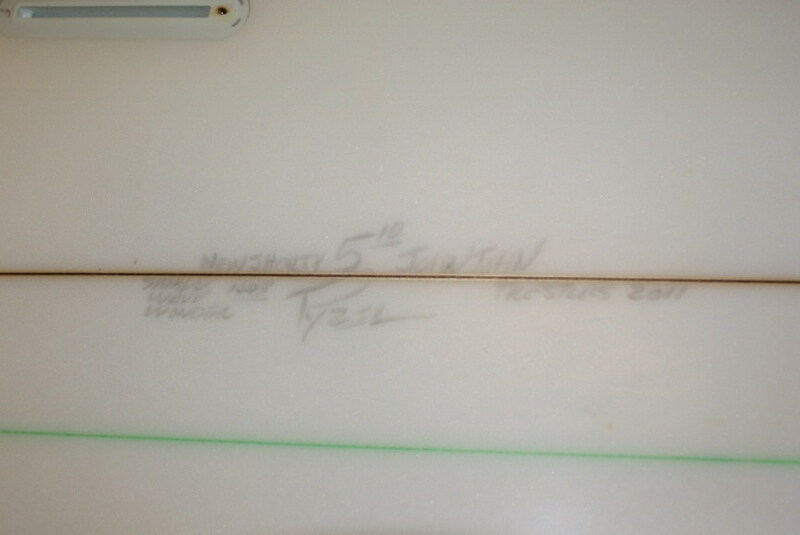 The board is a Pyzel 5’10’’ and it is John John’s board Trestles 2011. Current bid stands at $1,100. Next up, we divert your attention to a Ben Eine piece from 2014. It is a spray enamels with cut stencils on surfboard. The dimensions of the piece are 69 x 18 x 3 inches and the current bid is $8,000. Finally, be sure to check out the board by Jeff Devine. This photographer from San Diego has been surfing as long as he has been taking pictures. Most of his career, he has been a photo editor with Surfer and The Surfer’s Journal. 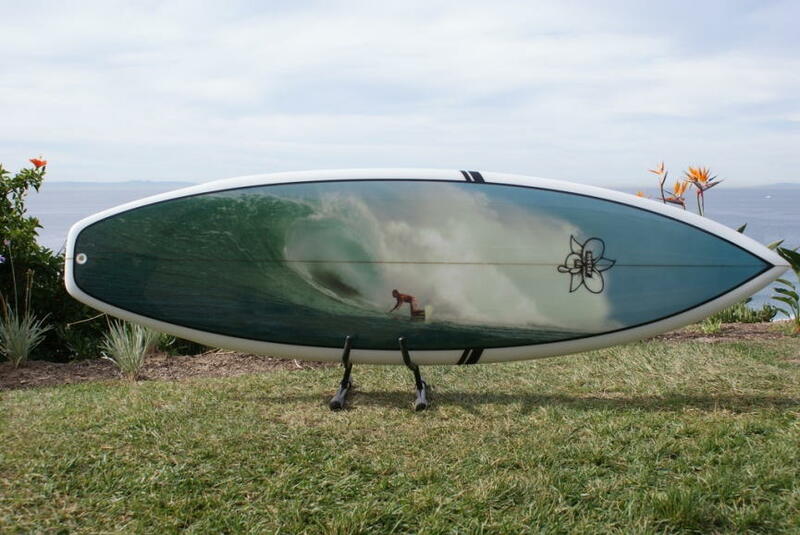 The Nectar Retro Simon Anderson Thruster, 6’2.25″ x 20.65″ x 2.55″, shaped by Gary MacNabb and signed by Simon Anderson with a photograph by Jeff Devine is currently at a price of $900. Before you go and bid for one of the pieces, check out another 6 boards we have found interesting. First up, be sure to check out a piece by engineering and design virtuoso of contemporary art Tom Sachs. His Autism Kills (2014) is krink ink on polyester resin and fiberglass, Bunger Surfboard, dimensions 100 x 22.5 x 2.75 inches, rests currently on the price of $15,000. Another exciting opportunity to acquire a piece by Ron English appears within this auction. English’s Marilyn with Mickeys (2014) is a printed photocloth surfboard, dimensions 78 x 21 x 2.5 inches. Current leading bid is $30,000. We divert your attention to a piece by another contemporary artist from the United States – Julian Schnabel. 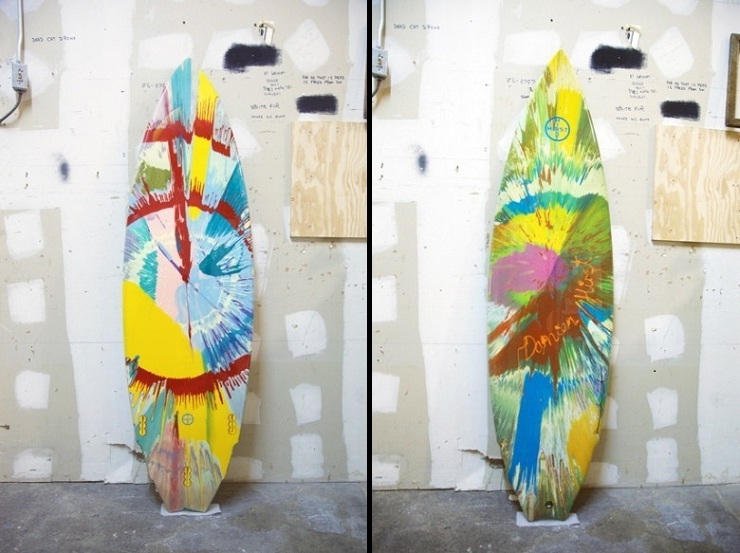 His Surfboard for Doc (2014) is a spray paint, printed t-shirt, resin, ink on surfboard, dimensions 100 x 22.5 x 2.75 inches. Current leading bid is $30,000. And finally, be sure to have a look at the pieces by one of the most talented and prolific designers working today – Marc Jacobs. As part of this charity auction, collectors and art and surf enthusiasts will have a chance to acquire one of three surfboards by Marc Jacobs. 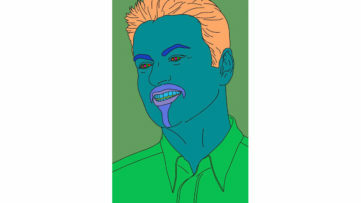 All three are of identical shape with different designs: the blue edition is currently on $600 and the green and red and whit editions have a leading bid of $700. Be the first to hear about the latest news and stories! Sign up for My Widewalls for FREE!